Suggestions of a Life Being Lived is a bold presentation of contemporary work that explores queer activism, intentional and imagined communities, self-determinism, and DIY alternative world-making. The exhibition features 16 artists working in photography, film, video, activism, and education. 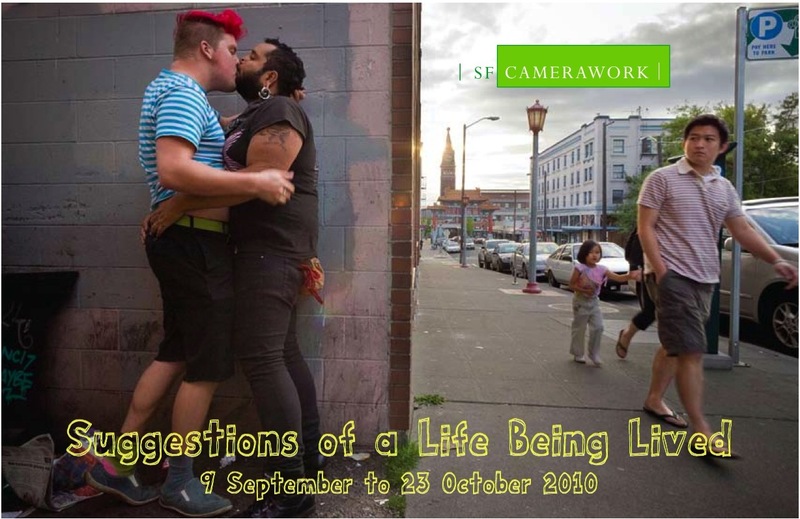 Organized for SF Camerawork by independent guest curators Danny Orendorff and Adrienne Skye Roberts, Suggestions of a Life Being Lived looks at queerness as a set of political alliances and possibilities that exist beyond the sphere of dominant gay and lesbian culture. Featured Artists: Gay Shame, Lenn Keller, Killer Banshee Studios, Darrin Martin & Torsten Zenas Burns, Tara Mateik, Mercury Vapor Studios, Jason Fritz Michael, Steven Miller, Allyson Mitchell, Aay Preson-Myint, Kirstyn Russell, Jeannie Simms, Eric Stanley, Chris Vargas and Greg Youmans. View images of the exhibitions. Hard cover, full color, illustrated catalog featuring extended exhibition essay available.